The water cycle a.k.a. the hydrologic cycle is continues process that we witness countless times, maybe without realizing it. Every time you fill your glass with water you are filling it with a liquid which has been on this earth longer than you or me. Water is recycled over and over again generation after generation water keeps going around in its cycle. We live on a planet which is mostly covered in water; in fact 70% of the world is covered in water. Although only 3% of this water is drinkable, the rest is salt water. To top it off only 1/3 of the fresh water is easily accessible to us the other 2/3’s are frozen in ice at the poles. 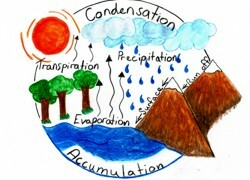 There are 4 main stages in the cycle, accumulation, evaporation, condensation and precipitation. Why don't you try this experiment involving the cycle of water. into the ground, this process in called infiltration. Water can also be stored in ice or snow on mountains where it may remain for a very long time. Evaporation means that the water changes its state of matter from a liquid to a vapour. Water can slowly evaporate over time and the sun greatly speeds up the evaporation process as it heats the water. A large amount of water evaporates from the oceans and other bodies of water, but it can also evaporate from plants which is called transpiration. Once the water has become vapour it starts to rise up into the sky as it is less dense than the surrounding air. Once the water vapour reaches a certain height temperatures begin to sink until it becomes to cool for it to remain as a vapour so it condensates. The tiny water droplets in the sky can be seen as clouds. In the form of clouds the water can travel around in the sky being pushed by different air currents. This means that the water may evaporate in one place, but rain down in another place. of snow, sleet, hail and of course rain drops and the water cycle start all over again. Go back from the 'Water Cycle' to the home.